This new French band is finally releasing its much awaited first album. The CD consists of a long piece split into several parts. The line-up is typical of the genre, with superb female vocals. The music alternates between sombre and serene atmospheres, with crystal-clear singing. At the crossroads of jazz, Zeuhl, pop and ambient. A CD that demands the listener’s full attention, and must be heard again and again to reveal its full magic. Digipack. Lovers of jazz, Zeuhl and musical ambition, Setna has just composed for you a gem that should find its way into many ‘best of 2008’ lists. Part of the Sesame collective, the French group shouldn’t remain unknown very long as it succeeds in the challenge of the debut album with truly surprising class and finesse. To describe Cycle 1, one has to imagine a wide-ranging, fascinating meditation on spiritual awakening in which each note or melody seems to imbued with an amazing sense of depth and mystery. Granted, this type of concept has produced more tedious musical ingenuity than major albums. Yet, far from the monotonous and boring stream of new-age affectations, Setna display enough talent to develop a real drive and poetic emulation, closer to some of Sun Ra’s iconic works (like the classic Lanquidity) than the ethereal path of Popol Vuh’s children. Fans of the “cosmic philosopher” should find much to enjoy here. In both form and content, the mystical theme of Cycle 1, made obvious in the piece’s titles, is handled with great accuracy by allowing the musical world it naturally creates to be more conflictual and energetic than one might expect. Spiritual work is no easy task, and mystical limpness are no more welcome than the violence of the material realm. Also, beginning with the track “Intuition”, the listener is gradually transported to more angular rhythmic contrasts and a denser instrumental treatment. Natacha Jouët’s voice, which brings to mind Petronella Nettermalm, works wonders. The album concludes with “Unity”, undoubtedly the album’s gem, which has a more typically Zeuhl temperament. A perfect and very sensual fusion of jazz and rock, it has the distinct of being enhanced by an outstanding solo by guitarist James Mc Gaw, of Magma and One Shot fame. Really thrilling stuff. The Zeuhl has kept revitalising itself for over than forty years. But to approach Setna’s music in the right way, one must forget Magma’s usual wild projections and immerse oneself in a sonic experience that’s impossible to segment. As light and penetrating as a fine rain, sovereign in its edifying power, Setna’s music will convince you that not only can the beauty of music be restored, it can also be given meaning. A true marvel. This Rouen-based sextet led by drummer-composer Nicolas Candé first made a name for themselves in 2004 when they shared some promising snippets of their early rehearsals online, generating a considerable “cyber-buzz” among Zeuhl- and/or Canterbury-oriented progressive music fans. They were promising but frustratingly short previews, and not until Setna’s performance at the 2005 edition of Les Tritonales were we able to assess the band’s true potential. The overall impression from the performance was positive, albeit with a few reservations. On the one hand, outstanding musical strengths, both in terms of instrumental ability, a number of memorable themes or, more generally, an adventurous and ambitious approach, with what was basically a 40-minute suite full of twists and turns. On the negative side, the somewhat predictable and complacent way in which each musician was offered a showcase and, especially, their decision to perform in near darkness, which some saw as a pretentious posture. Three years later, with a couple of line-up changes in the meantime (a new – female – vocalist and a new reedsman), here finally is Setna’s debut album, on Alain Lebon’s Soleil Zeuhl label, resurrected for the occasion (another piece of excellent news). From the first listen, the impression is one of extreme care in all departments, to the point even where such perfection almost seems suspect. The general soundscape is very familiar, clearly rooted in the 1970s, halfway between Magma and Six-era Soft Machine, with intertwined Fender Rhodes cyclic motifs, a subtle and discreet rhythmic support, mostly odd metres, and a melodic role split between vocals, soprano sax and synthesizer. What is disconcerting at first, however, is the overall peaceful and meditative atmosphere, favouring gently hypnotic repetition to the electric climaxes that are usually the expected highlights in an album of this style. Some may therefore get the impression that the essential is missing, that Setna is spending too many of these fifty-one minutes paving the way for an apotheosis that never comes. In fact, one of the few moments, even the moment, when the band really “let go”, is the opening track. You don’t have to be a clairvoyant to understand that Setna is after something else entirely. This general impression of serenity leads one to reconsider what might have been interpreted as pretentious posturing, revealing something more akin to a form of mysticism. This can be perceived in this way the band, with endless patience, arrange dynamic progressions that alternate phases of apparent standstill and slow build-ups. That movement can sometimes seem imperceptible to a listener not fully immersed in the music, or reluctant to surrender to its hypnotic power, who may then find the thirteen minutes of “Intuition”, the third track, frustrating, if not interminable, and will have to wait until the latter half of the album, from “Conscience” onwards, for the composing to gain in density and substance, and enthusiasm to clearly prevail. Whether it takes that long to appreciate what Setna are doing, the aptly-titled “Unité”, the album’s 11-minute closing track, will surely be received with unanimous praise. Setna here enjoys a prestigious reinforcement in Magma/One Shot guitarist James Mac Gaw, whose soloing engineers an irresistible crescendo throughout the first half of the piece, from the almost free introduction to the dazzling finale in which the Moog takes over with equal panache. Ultimately, this wonderful album, which might have been assumed to be reserved only for avant-prog circles, reveals a crossover potential that make it just as recommended to lovers of more conventional forms of progressive rock. 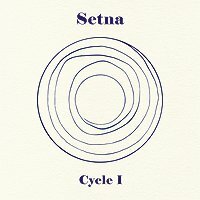 Melodic, captivating, hypnotic and timeless, Setna’s music asserts its uniqueness, achieving a successful balance between two qualities that are sometimes wrongly thought to be mutually exclusive : accessibility and integrity. A confirmation, then, to be followed very soon by the band’s return to the stage, as Setna will return to Le Triton on June 18th, on a double bill with Italy’s DFA (clearly not to be missed), as part of the 2008 edition of Les Tritonales.